As noted in the previous post, I helped facilitate an open online course called OOE13 (Open Online Experience 13) in 2013 and 2014. In April 2014 I was in charge of the topic of open education for the course, and we had a couple of Twitter chats. This was actually the first one though it is coming second here in my post order. I’m archiving the tweets here because Storify is going away in a few days. So think of this post as having been here since 2014. I’m participating in a course called “Open Online Experience 2013″ (which actually goes until May 2014! ), which is a professional development course for educators, focused on educational technology. This month we are focusing on digital literacy and digital citizenship, and earlier this week we had a Twitter chat about these topics that really got me thinking about my role in helping students think carefully about what and how they put online when I’m asking them to do blog posts and comments. Because I’m so busy with so many things at the moment, all I could manage to do was make an audio recording of my thoughts (much faster than writing them out). I did it while driving, taking a cue from Scottlo at ds106 radio, who often does live broadcasts and recordings while driving to work. I put my phone in my cup holder, shielded a bit so it wouldn’t move too much (a suggestion by Scottlo), and used the built-in mic to record the sound. It’s actually not too bad, considering. I had tried earlier with the microphone attached to my headphones, and the sound was much worse–the car noise really drowned out my voice. In this one, the main problem is the clicks and bonks you can hear from me switching gears, since the phone was right next to the gear box. But still, it’s not too bad. It’s about seven minutes long, so it shouldn’t take too much time to listen to! If you just click the link below, it should play…let me know if it doesn’t work. Posted in OOE13 on January 18, 2014 by Christina Hendricks. 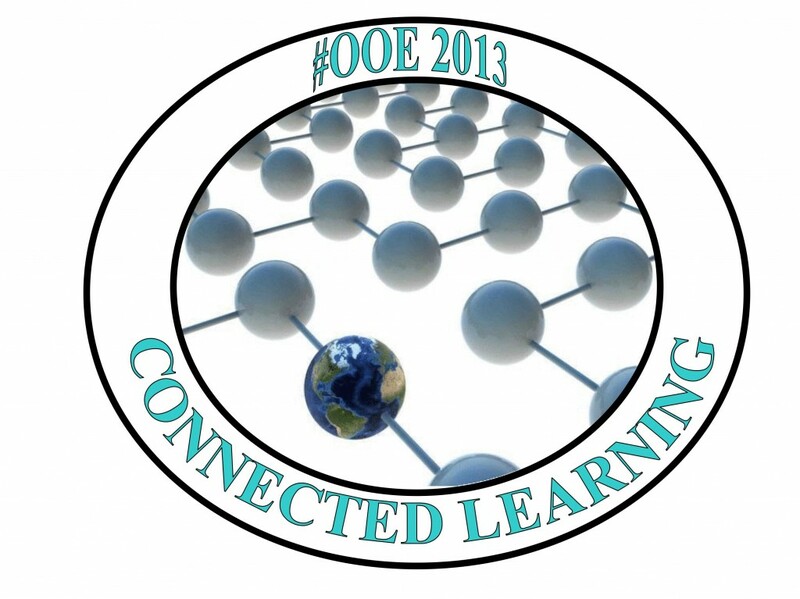 In a few short weeks, a new open online course will begin, called #OOE13, Open Online Experience 2013(-2014). It is designed as a profession development experience in educational technology for educators, but it is open to anyone who would like to participate. It starts September 4, 2013. I am one of the many, many people who have helped to shape this course, and who will be helping to run it. And I mean many! There are probably 50 or 60 people who have contributed in one way or another! It has been (and I expect will continue to be) a great experience in collaboration. I’m writing this post, though, to encourage others to join #OOE13, by noting its similarity to a course I did in January-March 2013, and which had a profound impact on me professionally and personally. It’s not exaggerating to say it changed my life in many ways. Those of us who are working together to make #OOE13 happen are hoping that will be the case for many of the participants as well. I’ll first describe a bit about ETMOOC and why I found this experience so valuable–the point here is that we have designed #OOE13 similarly, hoping that others will also have a great experience. So in describing ETMOOC, I’m also giving you a flavour of #OOE13. So please read on and see if this sparks your interest, and if so, you can register for #OOE13 here! This was a connectivist-style MOOC (massively open online course) (see my post on what I think a “connectivist MOOC” means), run by a large group of people from many different professions and educational institutions. It lasted for ten weeks or so, and every two weeks there was a new theme relating to educational technology (Connected Learning, Digital Storytelling, Digital Literacy, The Open Movement, and Digital Citizenship). You can see more about each of these topics at the ETMOOC main site, which has posts explaining some aspects of each topic and giving resources, on the front page (just scroll down). To be quite honest, I wasn’t sure about joining this course, because I wasn’t terribly interested in educational technology. But I had heard of “connected learning” and the “open” movement, and wanted to learn a bit more about those; plus, the structure of the course seemed interesting. So I tried it. Each week there would be one or more presentations on BlackBoard Collaborate that you could join live from anywhere in the world, or watch the recording later. We had guest speakers from various parts of the world on these topics (though all English-speaking). Then we had suggested other things to read/watch/do each week. We were highly encouraged to reflect on what we were seeing/reading/doing in our blogs, which were connected to a blog hub–so you could easily find blog posts from each person in the course. We also were encouraged to comment on each others’ blogs during the course, to get conversations going that way. In addition, we had a one-hour chat on Twitter each week, on the #etmchat hashtag. I hadn’t used Twitter much before that, and didn’t realize how effective Twitter chats can actually be. You may think you can’t get much done in bursts of 140 characters, but I was surprised at how rich and effective the discussion was at times. Here is a record of our chat on digital literacies, and here is one on open education (best to scroll all the way down to the very beginning and start there, b/c it’s in backwards chronological order). One very nice thing about ETMOOC was that there was no pressure to continue through the whole course, or to do all the activities. It was clear there was an open door to come in and go out when you wanted, and to do as much as you wanted. This felt freeing, for the times when I just got too busy. And since the topics changed every two weeks, new people could start with a new topic and there wasn’t a sense that they needed to go back and “catch up” on anything. I’ve got a couple of records of what I did in ETMOOC, in case anyone is interested. First, I’ve got quite a few blog posts I wrote during ETMOOC, which can all be found by clicking on the “Etmooc” category on the right menu. I also put together a more connected narrative of what I did in ETMOOC, which can be found here on my blog. 1. Making Connections –that’s the best way for me to think of putting it, but it can sound more crassly self-interested than I mean. By making connections I mean that I found many people in different parts of the world who are interested in similar things as I am in terms of teaching and learning, and whom I can now talk to long after the course is done. This is great, because it means having a group of people you can engage in discussions with about, not just educational technology, but pedagogy generally. For me, it’s like when I go to a teaching/learning professional development workshop and meet interesting people and talk to them about pedagogy and get great ideas…except when that happens it all ends when the workshop ends. Sure, we could meet up again, but we’re all busy and usually that doesn’t happen. But with an online course like this, the connections and discussions seem easier to keep up. I’m not sure why, but that’s been my experience. I can do it from home, on my own time, talking to people on Twitter, on blogs, on Google+, or other social networking sites. We don’t have to schedule a meeting to be somewhere face to face at the same time (though sometimes we try to schedule video or audio chats on Skype or Google Hangouts, because we do want to talk in real time; even then, it’s easier because we don’t have to get to the same location). A number of us found these connections so valuable we started a “post-etmooc” group on Google+, in which we read blogs or online journals and discuss them. We also have Twitter chats. And this is all after the course is long finished! Beyond that, I’ve “met” (through online means such as blogs, Twitter, Google+, Google Hangouts) many, many people whose work I continue to read on their blogs, who I continue to talk with on Twitter, and who share helpful links with me about pedagogical topics we’re interested in (and vice versa!). What this means is I’ve developed an online Personal Learning Network––a network of people from whom I learn and who learn from me (here’s a nice, in-depth video explaining PLNs, and here’s a shorter one with people’s views of why they find them valuable). It’s a group that talks about things related to teaching and learning generally, and includes K-12 teachers, higher ed faculty, educational technology specialists, businesspeople, and more. We not only share links of interest, but we ask questions of each other, support each other when there difficulties, offer advice/suggestions, and more. I have found this of immense value professionally–and personally! Over time some of these connections have developed into friendships, even before we have ever met in person. And several of these connections have turned into professional collaborations on other projects, such as #OOE13 itself. A number of ETMOOC participants have gotten together to plan #OOE13, modeling it in large part on ETMOOC, and hoping to share what has been a great experience for us, with others. Since doing ETMOOC I’ve begun to focus my professional research and activities much more on things I had never even heard of before, such as open education, connectivist MOOCs, blending on-campus courses with an open online component, making digital audio and visual media for courses and having students make them as well, and more. I decided a couple of months ago to create a mind map to show all the things I’ve begun to do as a result of ETMOOC, just to try to explain how much it has affected my professional life. You can see it here. It’s pretty self-explanatory! We’ve designed OOE13 with the same basic structure as ETMOOC, and, as you can see from the list of topics (scroll down on this page), a similar content focus. We’ll have guest speakers doing synchronous presentations (which will be recorded for later viewing), Twitter chats, a Google+ group, and we’ll encourage people to post on their blogs and comment on those of others. The main difference is that we’ve designed #OOE13 so that teachers and faculty could participate more easily during busy teaching terms. This means spreading the course out over an entire academic year (September to May) rather than having it be 10-12 weeks. The reason we did this is so that people have more time to watch recorded presentations if they couldn’t be there live, and to write blog posts/comment on posts from others. If there is a lot to do from week to week and people feel like they can’t keep up because they are busy, they may be less motivated to continue–even though we will stress, like ETMOOC did, that you don’t have to do everything, and it’s fine to move in and out! So instead of new topics every two weeks, we’ll have new topics each month. You can join in anytime and leave anytime, whatever suits you. I found I got a lot out of ETMOOC by being pretty active for most of the time, but that may not suit your schedule. If you want to just watch some presentations, that’s fine! If you want to blog about them too and comment on others’ blogs, that’s great–and you may make connections in the process! If you want to join in the Tweet chats, go ahead…even if you’re not doing anything else in the course. Drop in to the topics that interest you…leave for awhile and come back…it’s up to you. Some schools connected to #OOE13 have programs where they will earn professional development credit for doing the course, but for others who don’t have that option (and for any participant, actually), we’re creating badges you could earn. We’ve got a few already, but will be adding to this set as the course goes along. There really is little to lose and potentially a lot to be gained, so why not give #OOE13 a try? Take another look at the website, and if you’re interested, sign up here! Posted in etmooc, OOE13 on August 21, 2013 by Christina Hendricks.